Well, everyone's in love with the one person they can't have and no one seems to be able to communicate their woe to anyone who could help. Must be Tuesday in Luxeland. 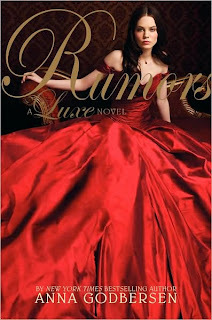 Rumors is the second volume in the Luxe series and, as the deep red dress and haughty gaze of the cover model suggest, things are just getting worse and worse for our crew of Manhattan debutantes/bachelors/scheming underlings. I checked this copy out from the library and the girl at the checkout desk smiled knowingly and said, "I liked this one." I smiled and said, "I just finished The Luxe." Her grin got bigger. "I liked this one much better," she said. So. There you go. I was beginning to get the impression that lovers of The Luxe fell into two categories: even bigger lovers or big time haters of Rumors. I was interested to see which category I fell into (if any). So everyone thinks Elizabeth Holland is dead. And pretty soon (oh, let's go ahead and say it) shockingly soon, everyone thinks Henry Schoonmaker should just say enough with the mourning and go ahead and marry Penelope Hayes since it is clear they were Meant To Be. What with the being rich and hot and whatnot. But then Elizabeth Holland is not actually dead, is she? And Henry is not actually in love with Penelope, is he? Meanwhile, Lina is masquerading about as a mining heiress from Utah (LOL), Penelope is advancing on Henry like a post-coital black widow, and the weight of the world rests squarely on Diana's little shoulders as she is the one who is now expected to make a most advantageous marriage to save the family name. Just not the advantageous marriage she'd like to make. I liked this one. Liked it just as much as the first one, in fact. I continue to enjoy Diana and Henry and what's going on there. I continue to hate Penelope unreservedly and feel almost unbearably embarrassed for Lina around the clock. Although I do wonder about Tristan. As I was never a fan of the whole Elizabeth and Will thing, I was perfectly happy to have them off screen (for the most part). And I have to say, I really liked the ending. I mean it was exactly the awful thing you were expecting down to the last dewy glance. In slow motion. But then the last page was just so awesome and fierce in its way, that I'm really looking forward to reading Envy and consuming another volume of decadent treats on display. I've been tempted by these books (the covers!) but have been holding off because of mixed reviews. I may have to give them a go now! Oh, I *hated* this one! With a PASSION! The whole "we can't get married because it will look bad" is never once countered with a "or we can just say that we bonded in our misery and... things happen." I mean, if Laurie can marry Amy, then Henry can marry Diana. 1) I'll just marry Diana, and then you'll have no ability to say anything about what we do. 2) Try it. I've slept with you, too. But he does NEITHER. What a buffoon. Diana is better off without him. Li, I did the same thing but ended up getting sucked in just the same. Ah, well. I wish Henry had done numbers 1 & 2 as well. All of the characters are unbelievably young and naive. But somehow I still find myself entertained and wanting to find out what happens to them. (same anon as above) I give the characters leeway for being incredibly young and naive. Like Lina and her crazy schemes and Diana sleeping with henry in the first place, and Elizabeth deciding that faking her own death was The Way to Go -- but this one, come ON, Henry! I just don't like to lose respect for my heroes like that. Too much of a romantic to watch them give up without a fight. Sigh. I'll probably still read the white-dress one. I'm weak. So weak. (You know, I used to think precisely as you did about Laurie and Amy -- I was militant about it! -- and then I saw Samantha Mathis and Christian Bale pull it off. I really believed in their romance, and they made me see why Jo would have been bad for Laurie. It's only because Amy. of all the March girls, is most tempted by Laurie's same frivolity, and yet overcomes it, that she can tame him and be his equal partner. I hated a lot of things about the Winona Ryder LW, but I LOVED the Amy/Laurie romance in that one. Angie, I shall endeavor not to be disappointed with you. we usually see so eye-to-eye. I trust your reviews implicitly. He is definitely lacking in backbone. Not one to speak of. And they are all a bit too inclined to pitying themselves in a corner rather than doing something about it. But then their lives/parents/social class haven't really allowed for much free thought or gumption. Which accounts for why I love Henry, but I don't LOVE Henry. Samantha Mathis and Christian Bale is definitely my favorite Amy/Laurie pairing. I bought that she felt herself his equal, just not that he would be completely fulfilled with her. But then I have never forgiven Amy for burning the book. I'm vindictive that way and so the fault is mine, I'm sure. You're not weak. Lol. I guess I'm holding out for Henry to grow a spine in the next one. Although, I'm open to the notion that at some point I'll throw back my head and howl at this series and be done with it. But for now (for better or worse) I'm staying tuned. I was hoping I had managed to convey the absolute brain candyness of this series in these two reviews. If not, I apologize and truly hope you are not too disappointed with me, Anon! oh, no, I love me some brain candy. I loved the Luxe, which is probably why I got so emotional about stupidHenrystupidstupid in Rumors. Now I'm just hoping Diana meets someone fabulous -- like the Jane Austen heroine who always ends up with the second man. I'm actually wondering if everyone will end badly in these books. Angie! Thanks so much for this review. I've had Rumors on my shelf for months and haven't yet read it. I enjoyed reading your review so much! While it's obvious you liked it, I appreciate your subtle--or not so subtle--jabs at the melodramatic story line and the characters' idiocy. LOL! I'm moving it up on the TBR list. And yeah... I'll probably want to read Envy when it comes out, too. Shallow, I know, but I can't seem to resist these luscious covers. Grin. Thanks, Christine. I'd definitely like to hear what you think of it now. I know what you mean. Sometimes you just have to give in and buy the sumptuous cover.